These bearings are designed to protect the engine and withstand the pressure peaks that originate from the fuel combustion chamber. The specially sealed needle roller bearing is a key component in modern turbocharged engines, playing a vital role in exhaust gas recirculation, helping to improve engine efficiency and reduce fuel consumption. These high precision throttle valve bearings are airtight in the event of both excess pressure and vacuum conditions. The seal on both sides of the bearing offers extreme resistance to high operating temperatures. Corrosion-resistant materials also ensure that the bearing is resistant to fuel, mineral oil, grease and acidic ‘blow-by’ condensate. Due to their integrated seals, the bearings can operate in temperatures from –40 deg C up to 150 deg C without any additional sealing. Motorsport is often a breeding ground for the development of engine components, which are then adapted for more general use in automotive passenger cars. Following the first Dakar Rally in 1980, Volkswagen and Audi engineers developed the legendary Quattro drive, adapted from the Iltis, a German all-terrain military vehicle (better known as the European Polecat) which competed successfully in the Dakar Rally. 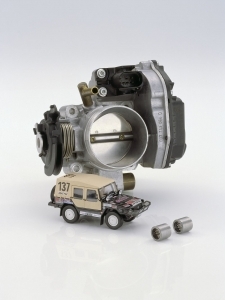 In 1980 Schaeffler engineers developed the first throttle valve bearing, a solution that prevented the fine Saharan dust particles from causing throttle valves to jam, causing the engine to seize. The solution was a specially sealed needle roller bearing with a compact design that has now long been considered a standard component in automotive manufacturing. This solution not only prevented defects on Dakar Rally vehicle engines, but also paved the way forward in terms of vehicle safety and fuel savings. Today, the risk of a throttle valve jamming while it is open is a thing of the past. But it was not until low friction bearing supports were developed for the throttle valve shaft that idle engine speed could be reduced in a controlled manner. While idle speed often exceeded 1,000 rpm until the early 1980s, speeds today are as low as 600 crankshaft rotations per minute, resulting in significant fuel savings. These small but critical engine components have also enabled the implementation of electronic ‘by-wire’ throttle valve controls.